In this article we are going How to Find last backup details of all databases in a server. 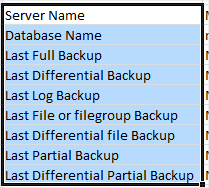 How to Find last backup details of all databases in a server? This script will Find last backup details of all databases in a server. Hope you will like How to Find last backup details of all databases in a server.